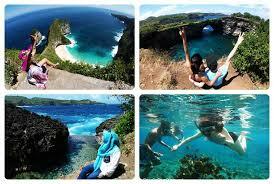 Fullday tour and Snorkeling to Nusa Penida island. Nusa Penida is an island southeast of Indonesia’s island Bali and a district of Klungkung Regency that includes the neighboring small island of Nusa Lembongan. The Badung Strait separates the island and Bali. The interior of Nusa Penida is hilly with a maximum altitude of 524 meters. It is drier than the nearby island of Bali. Nusa Penida Snorkeling is a fantastic marine activity to see the coral panorama, colorful fish and other unique marine life. This adventure will bring you a fascinating experience with a professional snorkeling guide that guides you the right snorkeling spot. It takes about an hour to explore and see the beautiful underwater life equipped with safety equipment. Crystal Bay Nusa Penida Bali is a fantastic place for snorkeling activities. Snorkeling is the activity of swimming on the surface of the water and see what lies beneath the surface of the water. Tools used are mask, snorkel, and fin.